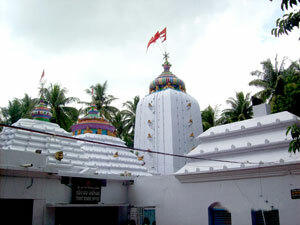 It is believed that there was a temple for Goddess built during the Gupta rule with a rekha vimāna and flat roofed Jagamohan at Jajpur. During the rule of the Somavamsis Candihar Yayati-II had constructed a magnificent temple; the said temple had been destroyed during the Afghan conquest in the year 1568 AD. In the first half of the 19th century a zamindar of Jajpur named Sudarśan Mohāpātra had reconstructed and repaired the temple that we found at present. The height of the temple is 70ft with the original padmapīṭha (lotus pedaled pīṭha) and a pīdha Jagamohan on the original flat-roofed Jagamohan the candīmaṇḍapa has been constructed in front of the Jagamohan for the purpose of worship and recital of Devi-mahātmya (śaptaśati candī) the temple walls bear fragmentary sculptures of different periods of history i.e. from the 4th century AD to the 15th century AD. There are several temples inside the complex namely Nābhigayā, Jūpesvara, Īśānesvara, Mṛtyunjayesvara, Bhuṣaṇḍesvara, Vagalāmukhī etc. and a large number of sivalingams preserved and worshipped in separate shrines also. The compound wall had been built by a saint Bhikari Das just before one hundred and ten years back. The compound wall bears a good number of Bhaumakara sculptures and images belonging to 8th -10th century AD. The lion-gate of the compound wall is very beautiful and magnificent.